The barrage of negative news reports about Environmental Protection Agency Administrator Scott Pruitt’s spending on travel, security and personal lodging prompted a nonprofit group to demand a broad investigation of the agency’s ethics program by its inspector general. On Tuesday, attorneys at Citizens for Responsibility and Ethics in Washington wrote to EPA Inspector General Arthur Elkins Jr. calling EPA’s system of consultations on ethics “broken and in disarray . . . This many scandals coming from one agency in so short a time may be unprecedented, and the systematic undermining of the agency’s ethics program has made a bad situation much worse,” wrote CREW Executive Director Noah Bookbinder and CREW Chair Norm Eisen, a former Obama White House ethics chief. 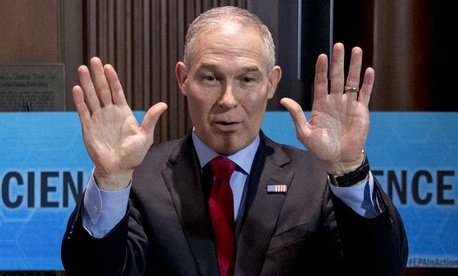 Pruitt and his team sought advice and permission for first-class travel and other potentially problematic arrangements from EPA Senior Counsel for Ethics Justina Fugh and Designated Agency Ethics Official and Principal Deputy General Counsel Kevin S. Minoli, the letter noted. The Government Accountability Office and several lawmakers have also weighed in on Pruitt’s alleged ethical lapses and conduct.